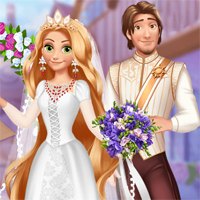 Organize the biggest day for this princess that takes place in the Middle Ages! The ceremony will take place at the Town Hall, where they used to have them in that time, because everyone would attend the wedding of royalties. Make it look extra pretty for this special day! Then you have to dress up the bride and groom. Style Goldie's lovely hair and choose for her one of the gorgeous wedding gowns you have available. For her boyfriend you have to pick an elegant suit, a pair of white gloves and a golden crown. Villain Wants To Be A..